Cross Finger Flap Surgery -- An injured finger is repaired by attaching it to the skin and soft tissue of a healthy finger to cover the defect. Last year Pinnacle Orthopaedics had a patient who was a construction worker operating a skill saw when he sustained a laceration to his left index finger. He sustained what is called in medical terms an open distal phalanx fracture with volar oblique tip amputation – meaning the tip of his index finger was cut off and bone was exposed. The patient went to the emergency room but his injury required a hand specialist to repair his finger. He then went to see Trevor Starnes, M.D., Ph.D. at Pinnacle Orthopaedics. Dr. Starnes is a Board Certified Orthopaedic Surgeon and is Fellowship Trained in Hand and Upper Extremity. The patient was in a lot of pain and needed this repaired quickly. He had two treatment options. The first was called a cross finger flap of the index finger to the middle finger. His fingers would stay attached for 3 weeks and then a second surgery would occur to separate the fingers. This would allow his index finger to stay almost the same length. He might have some stiffness of the index and middle fingers but overall his finger would cosmetically heal well. The second option was to have to amputate back to the DIP joint (the first joint from the tip) and then get enough tissue to cover the new tip. He would lose his nail and length of his finger. Of course, the patient chose the cross finger flap surgery. A few days later, the surgery was performed and the two fingers were attached using the skin and soft tissue from the middle finger to cover the defect in the index finger. Three weeks later, the second surgery was performed to separate the fingers and the tip was successfully covered with his nail intact. He went back to see Dr. Starnes after surgery and was doing very well. He was allowed to return to light duty at one month after the initial injury with lifting restrictions. The patient worked with hand therapy to get motion and strength back and was cleared to return to full duty at 3 months after the original injury. The patient was cleared to return to light duty 1 month after original injury and full duty 3 months after the original injury! 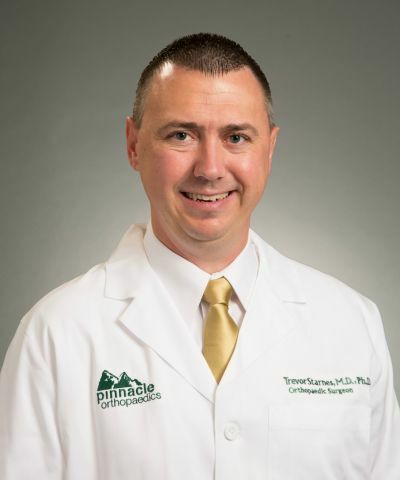 Trevor T. Starnes, M.D., Ph.D., is a Board Certified Orthopaedic Surgeon and is Fellowship Trained in Hand and Upper Extremity. He also holds a Doctorate of Philosophy in Biochemistry and Molecular Biology. His specialties include orthopaedic surgery with an emphasis on hand, wrist, elbow and shoulder surgery. Dr. Starnes sees patients in the Marietta, Canton, East Cobb, and Woodstock locations of Pinnacle Orthopaedics.